In this post I’m going to talk about why you should do your own bike repairs instead of taking your bike to a bike shop. Firstly bikes are extremely simple machines, especially those without suspension or hydraulics brakes. Most people don’t need the aforementioned parts and if your in the market for a new bike and don’t plan on doing any serious mountain biking, I would suggest you avoid bikes with suspension and hydraulic brakes. The reason I say that is most low end bike will come with suspension that doesn’t work well to start with and will only get worse with time and besides, you probably don’t need it. Fixing your own bike like fixing anything is an extremely rewarding experience but trying to do it without the right knowledge and some simple tools can be extremely frustrating. Fixing your own bike can also save you a lot of money, a full bike service can cost anywhere from £40 upwards for labour alone. If you fix your own bike you will not only be saving the labour cost but you’ll also make a saving on parts because most brick and mortar bike shops sell components at a higher price than can be found on the web. Some websites sell bike parts at enormous reductions, some parts may be from previous years but most haven’t changed much in design the last decade and they’re some real bargains to be had. So by now you should be thinking that you want to have a go at fixing your own bike. In this post I’m going to start by looking at chain lubrication and wear, I will post a follow up on adjusting your gears and brakes. Firstly, gears change much smoother if you have a properly lubricated chain, so start by doing that. 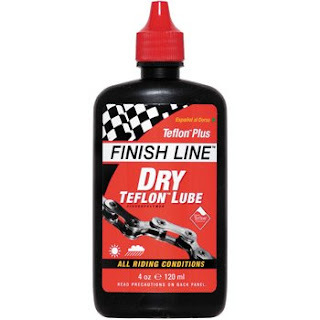 It is worth buying bike specific bike chain oil because it won’t attract as much dirt as general purpose oil, I use finish line chain oil and would recommend it but anything bought from a bike shop should be suitable. I wouldn’t recommend GT85/WD40 as a replacement for chain oil as it will disperse the oil that’s already on the chain and wash off as soon as it rains leaving your chain dry. Both GT85 andWD40 work well as a degreaser and I would suggest using either of them or even better a specific bike degreaser on your chain before you put the oil. Either spray your chain with GT85/WD40 or put some liquid degreaser on a old rag and then back pedal to remove any old oil/dirt. Then apply the new oil by dripping it on the chain as you backpedal the full length of the chain and leave it to soak in for an hour before using old rag to remove any excess from your chain. You must periodically change your chain and cassette(rear cogs) or your gears will skip. This is because over time as you cycle you remove small amounts of metal from your chain and cassette. I've taken some photographs of the cassette on my current bike and an old worn one I found in the garage to illustrate what happens over time. In the below image the arrows point to equivalent sprockets on two different cassettes, the new cassette on the left and the old worn one of the right. The worn teeth on the old cassette are noticeably sharper and I should have probably retired this cassette earlier than I did. Depending on your cycling habits you are more likely to use some gears than others and on the old cassette you can see a difference in tooth thickness between the different sprockets. It is impossible to look at a chain and see if it is is worn so you need a tool to help, I would recommend buying a chain checker. 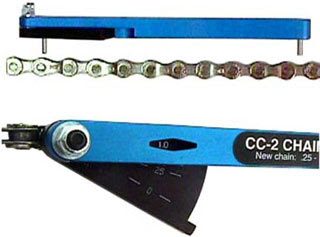 As you wear metal from your chain the distance between links decreases (which no longer matches the size of the gaps in your cassette-hence it slipping), a chain checker measures how much you've worn from your chain and make it possible to know when its time to buy a new chain. If you don't know already Park make great bike tools and I would recommend their chain checker, the one in the image to the left. 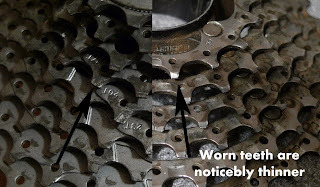 For a more detailed look at chain wear take a look here. 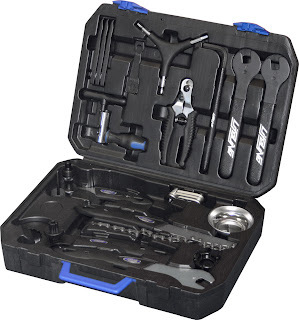 For general bike repairs I find the Park Tools website a great free resource.